– Push the lever at the bottom of the mirror away from you. – Pull the lever at the bottom of the mirror towards you. – Press button A ⇒ fig. 71 - the indicator lamp B will go out. – Press button A - the indicator lamp B will light up. The anti-dazzle function is activated every time the ignition is switched on. The green indicator lamp lights up in the mirror housing. Electrolyte fluid can leak from a broken mirror. This fluid can cause irritation to the skin, eyes, and respiratory organs. Wash thoroughly with clean water should you come into contact with this fluid. Seek medical assistance if needed. Electrolyte fluid leaking from a broken mirror can cause damage to plastic surfaces. Use a sponge or similar to remove the fluid as soon as possible. • If you switch off the anti-dazzle function for the interior mirror, this will also deactivate the anti-dazzle function for the exterior mirrors. • The automatic anti-dazzle function will only work properly if the sun blind* for the rear window is not in use and there are no other objects preventing light from reaching the interior mirror. • Do not attach any stickers to the windscreen in front of the sensors, as these could lead to malfunctioning of the mirror. 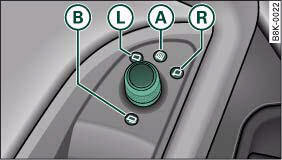 – Turn the adjuster knob to position L (left exterior mirror) or position R(right exterior mirror) ⇒ fig. 72. – Move the knob as required to adjust the exterior mirror for a good rearward view. Heated mirrors – Turn the knob to position A.
Retracting both exterior mirrors* – Turn the knob to position B. The mirrors are heated depending on the outside temperature until the ignition is switched off, even if the knob is no longer in position A. It may be advisable to retract* the exterior mirrors to protect them when parking or when driving through tight spaces. On vehicles with memory function for the driver's seat, the setting of the exterior mirrors is automatically stored together with the seat position. When reverse gear is engaged, the mirror surface tilts slightly downwards, provided the mirror control is switched to the exterior mirror on the passenger's side (knob in position R ⇒ fig. 72). This provides a better view of the kerb when parking. The mirror returns to its original position when reverse gear is disengaged and the vehicle is driven forwards at a speed above about 15 km/h. The mirror will also return to its original position when the adjuster knob is turned to the position for the driver's exterior mirror L or when the ignition is switched off. If the position of the mirror surface is changed while the mirror is tilted, this new position is automatically stored and assigned to the remote control key when you disengage reverse gear. • Convex or wide-angle* exterior mirrors give a larger field of vision. However, they also make objects appear further away than they actually are. For this reason, you should not rely on these mirrors for judging the distance of vehicles behind. • If one of the mirror housings is knocked out of position (e.g. when parking), the mirrors must first be fully retracted with the electric control. Do not readjust the mirror housing by hand, as this will interfere with the mirror adjuster function. If the electrical adjustment should ever fail to operate, the mirrors can be adjusted by hand by lightly pressing the edge of the mirror glass. The exterior mirrors darken together with the automatically adjusting interior mirror. 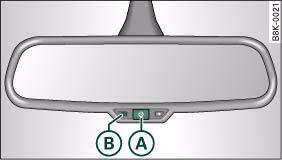 When the ignition is on, the mirrors will darken automatically according to the amount of light received (for example from the headlights of a vehicle behind). When the interior lights are switched on, or when reverse gear is engaged, the mirrors revert to their original (i.e. not darkened) condition. Electrolyte fluid leaking from a broken mirror can cause damage to the paintwork or plastic surfaces. Use a sponge or similar to remove the fluid as soon as possible.